It’s time for a walk! Wait, I don’t have a leash and collar! Well, we need to change that! It is very important to choose the right collar and leash for your dog. There are so many to choose from and so many pros and cons to consider. 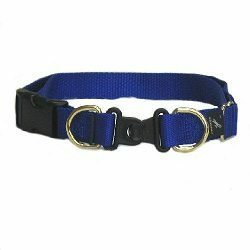 Following is a list of different types of collars available. It’s up to you to make the right fit for your walking and everyday needs. It is not uncommon to have more than one collar that you like to use for multiple uses. These collars provide an easy way to attach identification tags to your dogs collar. If by some chance your dog gets away from you, it is important to have identification on your dog with their name, your address, and maybe even your phone number on it so that your dog can be returned to you safely. These collars are the most common to find. They usually close with a buckle or a plastic clip. These collars can easily be slipped on and off your dogs head. This type of collar can become a potential danger, though. If your dog is playing with another dog and they are being mouthy with one another, their teeth can easily become caught on the collar and could be a serious safety issue. This collar can also be a choking hazard if your dog gets caught up while digging under a fence or running around where they could get caught on something. This type of collar is generally used for training. 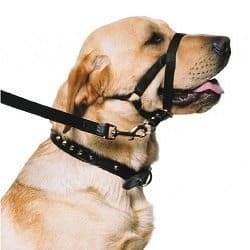 They have discovered many more effective ways to train your dog without the use of choke chains, so they are not really recommended anymore. 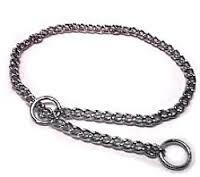 Choke chains are generally used to “correct” your dog’s behavior. I do not recommend this type of training because I find that reward training is far more effective of a training tool. But basically, for example, if you’re walking your dog and they are pulling on the leash, you yank the leash to correct your dog from pulling. I do find that doing this only causes a tug­of­war scenario where you will both just pull on one another without actually correcting the behavior. Choke chains should never be left on an unattended dog. They provide a choking hazard as they could potentially get caught on something and your dog could get seriously injured. These collars are also used widely for training and are not recommended. 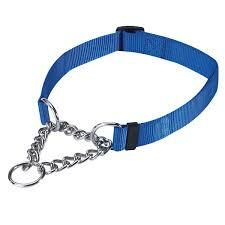 They are similar to a choke collar, only there are prongs that when you pull on the leash, pinch into the neck. They should only be used by a trained professionals. They are incredibly dangerous to leave on your dog because they could seriously injure them if it gets caught on anything or if your dog is playing with another dog. Harnesses are a great choice if you are an active person and would like your dog to pull you. If you like roller skating, sledding, or skateboarding, you can have your dog pull you around! This is a safe walking device that is gentle on the neck. Most of the pressure will be focused on the shoulders of the dog instead of the sensitive neck where you could restrict breathing. Unfortunately, sometimes this type of walking device can cause your dog to want to pull. It is known to encourage pulling in some cases. So this may not be the type of collar you want to use on a dog who you are having pulling issues with. A halter is a great choice for taking control of your dog. 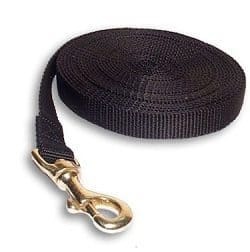 These are great for dogs prone to pulling. This device gives you complete control of your dog’s head. And when you have control of the dog’s head, you have control of the dog’s body. This collar looks like a horse’s halter. It’s designed to have a band going around the back of the head and another around the nose. The leash is attached under the dog’s chin. When you pull on the leash, the dog’s head will get pulled down or to the side, giving you complete control of their head, making it impossible for them to continue forward. 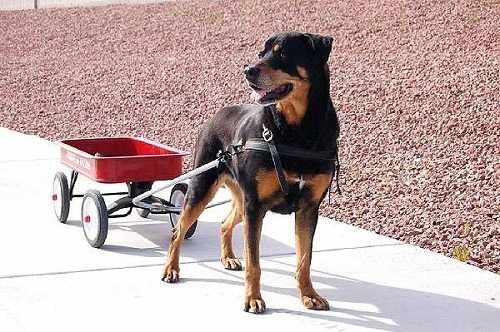 This is a great solution if you have a dog that likes to pull you and take you for a ride. You can have complete control of your walks from now on with a halter collar. This collar is great for everyday use, and has a safety feature that prevents choking. There is a special loop that will break if it gets caught releasing your dog from the dangers of being choked. It is still possible to walk your dog with this collar on without risk of breaking the collar, too. 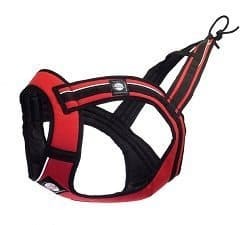 What you do is attach the leash to both ends of the collar where the breakaway loop is connected to both ends of the collar. These collars are similar to a flat collar, but they tighten around the neck if the dog pulls. 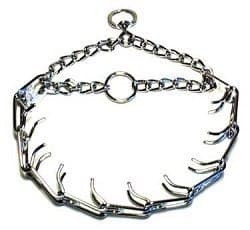 Despite the fact that they tighten when they pull, they are not like a choke chain collar which is mainly used for “correction”. These collars are used mainly for dogs that are at risk for slipping out of their collars. They are much less likely to slip over your dog’s head like a flat collar is. They should be adjusted so that at the tightest, it will not choke or strangle your dog. Following are different types of leashes available. You may also find, like with collars, you may like to have several different leashes for different purposes. 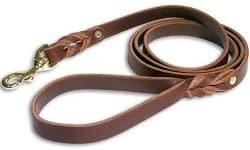 These types of leashes you can find in 4 to 6 feet in length. These leashes are great for walks and also for training. The 6 foot lead can be used to train your dog to stay and come because you can get a decent distance from them and still be attached incase they decide they want to wander off on you. They come in either leather or fabric, but the decision is ultimately yours. It’s just what ever one you prefer the feeling of. This type of leash is for the dog that likes to chew on their leash. I’m sure if you are the owner of a leash chewer, you have been through many leashes at this point. 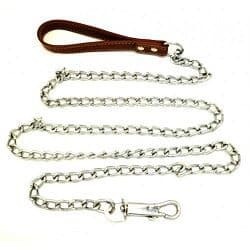 The chain leash may be cumbersome, but they will prevent your dog from destroying their leash. This leash is not recommended for training. It is not an effective leash for a dog who is prone to pulling. This is widely because it is not the most comfortable leash to hold. It can pinch your hands and can be incredibly dangerous. If you were to get the leash wrapped around your hand or fingers when your dog decides to take a run for it, you could lose a finger! A retractable leash is a leash that will extend. This is a great leash if you want to allow your dog to explore during your walk. It will give them lots of room to run around. This can be a difficult leash to get used to, it takes some practice. It can also get wound around objects, so you must be cautious and aware of your surroundings. This is a 10 to 30 foot leash that is great for giving your dog tons of room to run around. 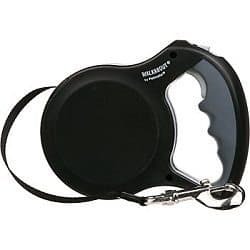 It is an even better tool for training than the normal 4 to 6 foot leash because it gives you even room to distance yourself if teaching your dog to stay or come. Use caution when using this leash. It can easily get wound around objects, your dog, or yourself. Which leash and collar to get ultimately comes down to what will work best for you personally. Your dog’s personality as well as your own should be considered, and don’t be afraid to try out different collars and leashes until you find one that works for the both of you.